At Diplomacy Works, we believe the best way to strengthen America’s security, protect our interests and spread prosperity is with a diplomacy-first approach to the world’s biggest challenges. As we face new and evolving threats around the world, we must lead through diplomacy and dialogue – working with allies and partners – because America’s strength derives both from our military might, which deters conflicts and defends our interests every day, and from our ability to address the core causes of conflict in ways that force alone cannot. There are few better examples of the value of diplomacy than the Joint Comprehensive Plan of Action (JCPOA): it has blocked Iran’s pathways to a nuclear weapon and has made the United States and our allies safer. Diplomacy Works provides information and analysis that empowers policymakers and stakeholders to make the case for upholding the JCPOA as a model of effective foreign policy with diplomacy as the tool of first resort reinforced by our unparalleled military capabilities – a policy which keeps America safe and strong at the same time. 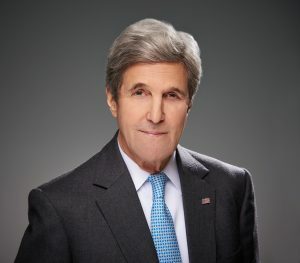 John Kerry served as the United States’ 68th Secretary of State from 2013 to 2017. As America’s top diplomat, he guided the Department’s strategy on nuclear nonproliferation, combating radical extremism, and the threat of climate change. His tenure was marked by the successful negotiation of the Iran nuclear deal and the Paris Climate Agreement. From 1985 to 2013, he served as a U.S. Senator representing Massachusetts, and was Chairman of the Senate Foreign Relations Committee from 2009 to 2013. He served in the U.S. Navy, completing two combat tours of duty in Vietnam for which he received a Silver Star, a Bronze Star with Combat V, and three Purple Hearts. He received his undergraduate degree from Yale University and his law degree from Boston College Law School. 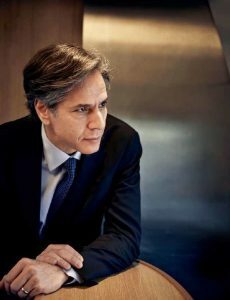 Antony Blinken is currently a managing director of the Penn Biden Center for Diplomacy and a distinguished scholar at the Johns Hopkins School of Advanced International Studies, as well as a contributing opinion writer for the New York Times and a global affairs analyst for CNN. He has held senior foreign policy positions in two administrations over three decades. Most recently, he served as Deputy Secretary of State (2015-2017). Previously he was the Principal Deputy National Security Advisor to President Obama (2013-2015), National Security Advisor to Vice President Biden (2009-2013), Staff Director for the U.S. Senate Foreign Relations Committee (2002-2008), and a member of the White House National Security Council Staff (1994-2001). At the State Department, he helped lead diplomacy in the fight against ISIL, the rebalance to Asia, the global refugee crisis, and established connections between the State Department and the innovation community. He is a graduate of Harvard University and Columbia Law School. 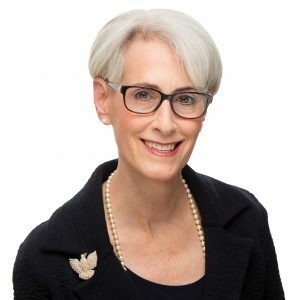 Wendy R. Sherman is Senior Counselor at Albright Stonebridge Group and former Under Secretary of State for Political Affairs. She is a Senior Fellow at Harvard’s Belfer Center, a member of the Council on Foreign Relations as well as the Aspen Strategy Group. Ambassador Sherman led the U.S. negotiating team that reached agreement on a Joint Comprehensive Plan of Action between the P5+1, the European Union, and Iran for which, among other diplomatic accomplishments, she was awarded the National Security Medal by President Barack Obama. 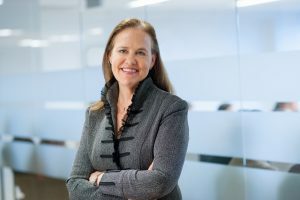 Prior to her service at the Department of State, she was Vice Chair and founding partner of the Albright Stonebridge Group, Counselor of the Department of State under Secretary Madeleine Albright and Special Advisor to President Clinton and Policy Coordinator on North Korea, and Assistant Secretary for Legislative Affairs under Secretary Warren Christopher. Early in her career, she managed Senator Barbara Mikulski’s successful campaign for the U.S Senate and served as Director of EMILY’S list. Ambassador Sherman served on the President’s Intelligence Advisory Board, was Chair of the Board of Directors of Oxfam America and served on the U.S. Department of Defense’s Defense Policy Board and Congressional Commission on the Prevention of Weapons of Mass Destruction, Proliferation and Terrorism. 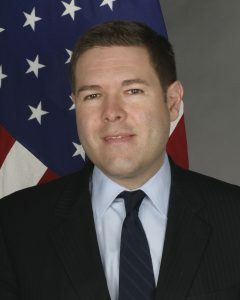 Nicholas Burns is currently the Roy and Barbara Goodman Family Professor of the Practice of Diplomacy and International Relations at the Harvard Kennedy School of Government. He is founder and Faculty Director of the Future of Diplomacy Project and Faculty Chair for the Programs on the Middle East and on India and South Asia at Harvard University. He served in the U.S. Government for 27 years as a career foreign service officer, including as: Under Secretary of State for Political Affairs (2005-2008); U.S. Ambassador to NATO (2001–2005); Ambassador to Greece (1997–2001); State Department Spokesman (1995–1997); Special Assistant to the President and Senior Director for Russia, Ukraine, and Eurasia Affairs (previously Soviet Affairs, 1990-1995). 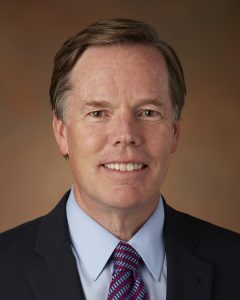 Burns has received twelve honorary degrees, the Presidential Distinguished Service Award, and the Secretary of State’s Distinguished Service Award among others. He has a BA in History from Boston College (1978), an MA in International Relations from the Johns Hopkins School of Advanced International Studies (1980), and earned the Certificat Pratique de Langue Francaise at the University of Paris-Sorbonne (1977). Michèle Flournoy is Co-founder and Chief Executive Officer of the Center for a New American Security (CNAS). She served as the Under Secretary of Defense for Policy from February 2009 to February 2012 and was the principal adviser to the Secretary of Defense in the formulation of national security and defense policy, oversight of military plans and operations, and in National Security Council deliberations. She co-led President Obama’s transition team at DoD. In 2007, she co-founded CNAS, a non-partisan think tank dedicated to developing strong, pragmatic and principled national security policies and served as its President until 2009. Previously, she worked at the Center for Strategic and International Studies and at the National Defense University, and in the mid-1990s she served as Principal Deputy Assistant Secretary of Defense for Strategy and Threat Reduction and Deputy Assistant Secretary of Defense for Strategy. She is a graduate of Harvard University and Balliol College, Oxford University, where she was a Newton-Tatum scholar. 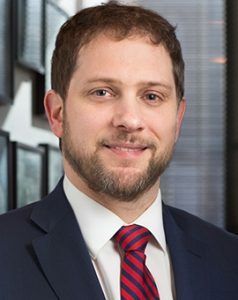 Colin H. Kahl is an associate professor in the Security Studies Program at Georgetown University’s Edmund A. Walsh School of Foreign Service. From October 2014 to January 2017, he was Deputy Assistant to the President and National Security Advisor to the Vice President. From February 2009 to December 2011, he was the Deputy Assistant Secretary of Defense for the Middle East at the Pentagon. In June 2011, he was awarded the Secretary of Defense Medal for Outstanding Public Service by Secretary Robert Gates. In 2007-2009 and 2012-2014, he was a Senior Fellow at the Center for a New American Security (CNAS), a nonpartisan Washington, DC-based think tank. From 2000 to 2007, he was an assistant professor of political science at the University of Minnesota. In 2005-2006, Prof. Kahl was a Council on Foreign Relations International Affairs Fellow in the Office of the Secretary of Defense. In 1997-1998, he was a National Security Fellow at the John M. Olin Institute for Strategic Studies at Harvard University. He received his B.A. in political science from the University of Michigan (1993) and his Ph.D. in political science from Columbia University (2000). Rob Malley is President and CEO of the International Crisis Group. 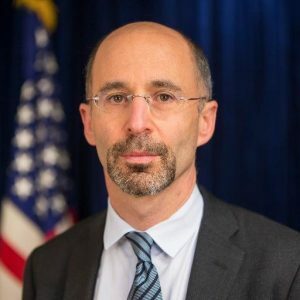 Previously, he served as Special Assistant to the President and White House Coordinator for the Middle East, North Africa, and the Gulf Region (2015-2017), Senior Director on the National Security Council Staff (2014-2015), Program Director for the Middle East and North Africa at the International Crisis Group, and Senior Policy Advisor for the Center for Middle East Peace and Economic Development. In the Clinton Administration, he served as Special Assistant to the President for Arab-Israeli Affairs (1998-2001), Executive Assistant to the National Security Advisor (1996-1998), and Director for Democracy, Human Rights, and Humanitarian Affairs at the National Security Council (1994-1996). He has also worked at the Council on Foreign Relations and clerked for Supreme Court Justice Byron White. He received his undergraduate degree from Yale University, a Ph.D. as a Rhodes Scholar at Oxford University, and his J.D. from Harvard Law School. David Wade is CEO of GreenLight Strategies, a public affairs and strategic communications firm, and a Fellow at the Carnegie Endowment for International Peace. His foreign policy analysis and opinion columns frequently appear in The Atlantic, Foreign Policy, Slate, The Boston Globe, The Hill, and Politico. Before leaving the Obama Administration, Wade was the Chief of Staff to the US Department of State for more than two years, the youngest person to hold that position. Foreign Policy Magazine described Wade as “the driving force behind the Department’s day to day operations… running a huge bureaucracy.” Wade was awarded the State Department’s Distinguished Honor Award — when he left government service to found GreenLight Strategies. For five years from 2008 to 2013, Wade was Chief of Staff to the Chairman of the Senate Foreign Relations Committee. He is a veteran of two presidential campaigns, both as the National Press Secretary for the 2004 Democratic presidential nominee, and the traveling communications chief for the successful 2008 vice presidential campaign of then-Senator Joseph R. Biden. A graduate of Brown University, a 1996 Harry Truman Scholar, 2011 John C. Stennis Fellow, Wade serves on the Board of Directors of the American Security Project, the Advisory Board to the Watson Institute for International and Public Affairs at Brown University, and previously served on the State Department’s Foreign Affairs Policy Board. 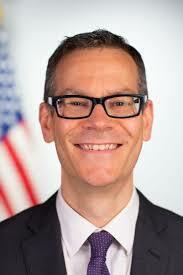 Jon Finer most recently served as Chief of Staff and Director of Policy Planning for Secretary of State John Kerry. Previously in the Obama Administration he served as Deputy Chief of Staff for Policy at the State Department, Senior Advisor to Deputy National Security Advisor Antony Blinken, Special Advisor for the Middle East and North Africa and Foreign Policy Speechwriter to Vice President Joseph Biden, and as a White House Fellow. Earlier in his career he was a foreign and national correspondent for The Washington Post. He received his bachelor’s degree from Harvard University, his law degree from Yale University, and an M.Phil. from Oxford University where he was a Rhodes Scholar. 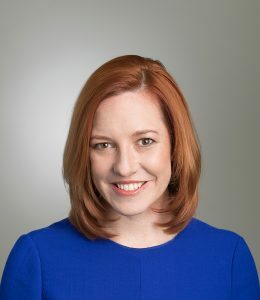 Jen Psaki runs her own consulting firm, Evergreen Consulting, and she is a political commentator on CNN. From 2015 to 2017, she served as the White House Director of Communications. From 2013 to 2015 she was the Spokesperson for the U.S. Department of State, and she was also previously the White House Deputy Communications Director, and the White House Deputy Press Secretary. She worked on President Obama’s campaigns in 2008 and 2012. She has also worked on Capitol Hill, at the Democratic Congressional Campaign Committee, for John Kerry’s 2004 Presidential campaign, and for political campaigns in Iowa. She is a graduate of the College of William & Mary. Jeff Prescott is a strategic consultant to the Penn Biden Center for Diplomacy and Global Affairs at the University of Pennsylvania. He served as Special Assistant to the President and Senior Director for Iran, Iraq, Syria, and the Gulf States at the U.S. National Security Council. Before that, he served as Vice President Joe Biden’s Deputy National Security Advisor and Senior Asia Advisor. Previously, he was a Senior Research Scholar and Lecturer in Law at Yale Law School and Deputy Director of Yale’s China Center. He founded and directed the Yale Center’s Beijing office in 2002 and was a Visiting Scholar at Peking University Law School. He is a graduate of Boston University and Yale Law School.